His parole was for possession of ecstasy, served 7 yrs. 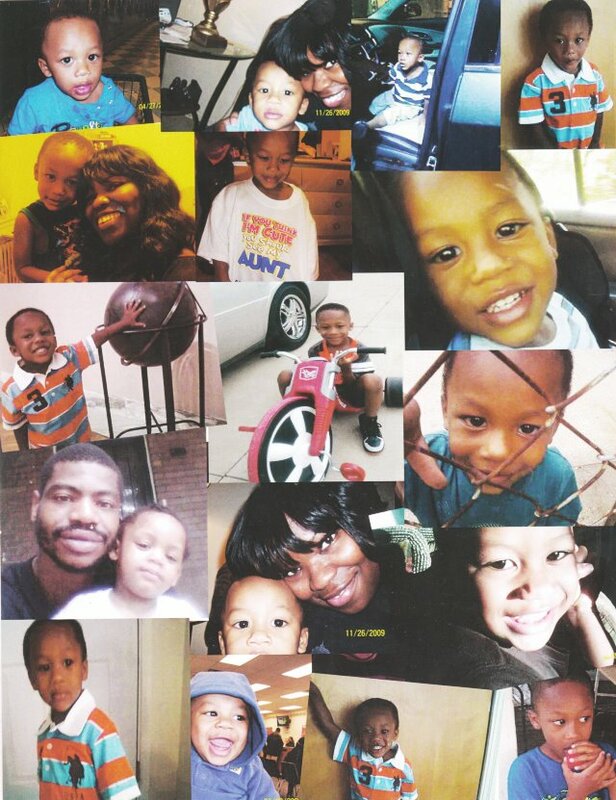 Hakeem Patterson, one of three cops in car that allegedly hit Lorenzo Harris’ car in high-speed chase, killing the Jackson children June 24, 2015. Facebook (photos of others were not available). 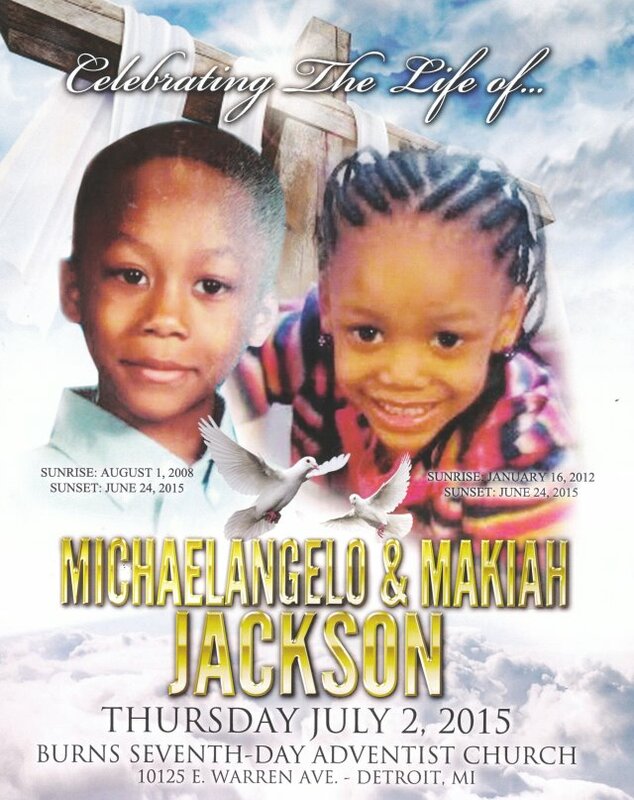 DETROIT – The three cops alleged to have bumped the car that hit and killed two young children, Makiah and Michaelangelo Jackson, 3 and 6 respectively, on June 24, are scheduled to testify against the driver of the Camaro, Lorenzo Harris, in court Mon. July 13, 2015, according to an article in the Detroit News. The cops are Richard Billingslea, Steven Fultz, and Hakeem Patterson. 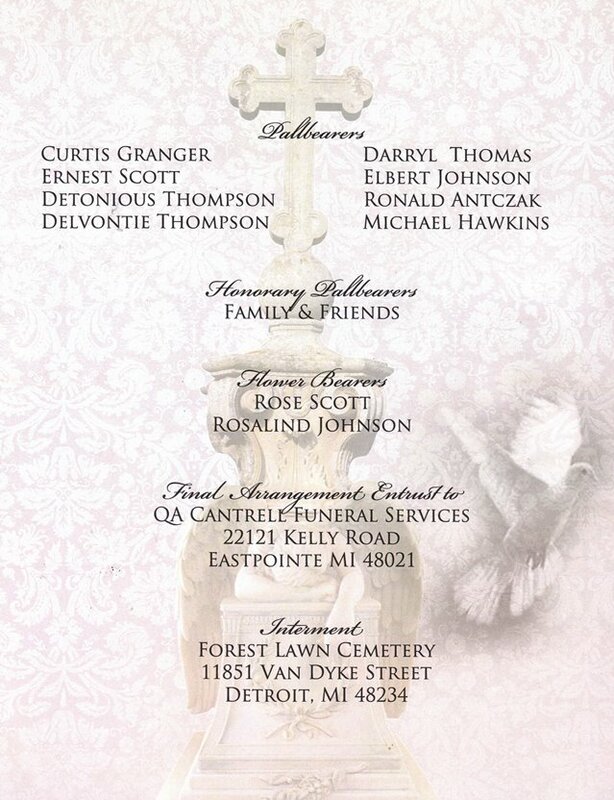 They will appear in the courtroom of Judge Shannon Holmes in the Frank Murphy Hall of Justice at 1:30 p.m. to testify at the preliminary examination of the car’s driver, Lorenzo Harris. 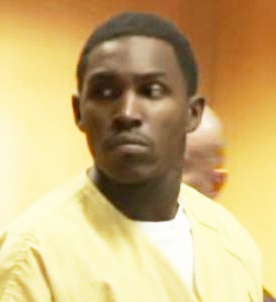 Lorenzo Harris in court July 6, 2015. The police appeared to have used an official maneuver called a “Precision Immobiliation Technique,” or PIT. 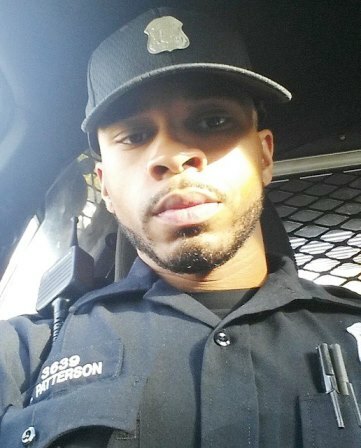 Subsequently, Detroit Police Chief James Craig reported that the dashboard camera in the police car was mysteriously not operable, even though the cops were “Special Ops,” and that police were not able to find a gun they claimed they saw in the car being chased. Several others at the vigil confirmed the original witness’s statement. 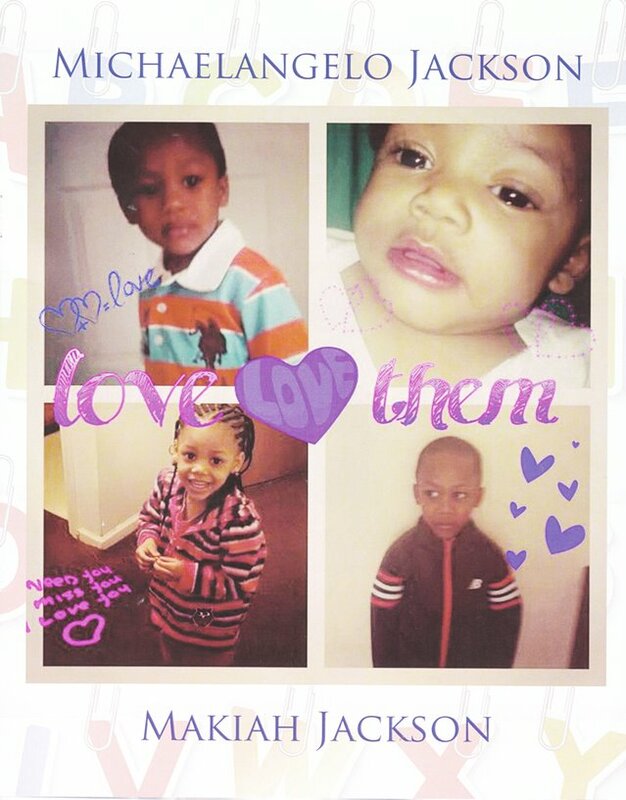 They added that the car then hit the light pole at the corner of Nottingham and Frankfort and careened down the next block, hitting and seriously injuring Darius Andrews, Jr. 3, Isaiah Williams, 5, and Zyaire Gardner, 7. Neighbors said the cops were still in close pursuit. “I feel that if they had anything to do with it, they should be held just as responsible as the driver,” said Ronald Antczak, fiancé of the children’s grandmother Nicole Jackson. 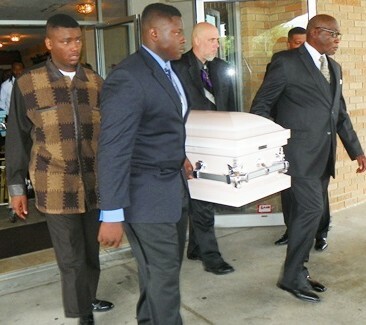 Ronald Antczak, fiancé of Makiah’s grandmother Nicole, third from left, helps carry her little pink coffin out after funeral July 2, 2015. 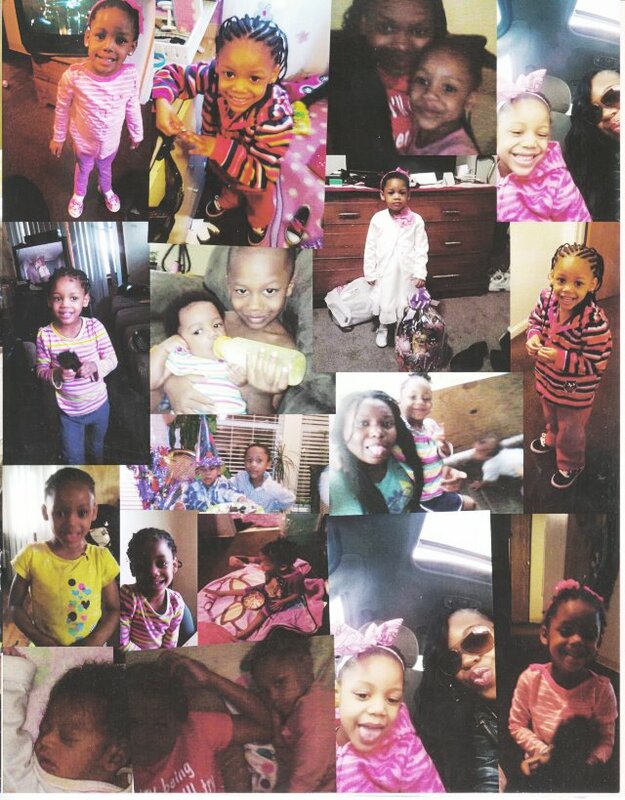 She said that Zyaire remained hospitalized in Ann Arbor with collapsed lungs, on a ventilator, and was expected to remain there for at least three months. Harris faces two counts of second-degree murder, three counts of failure to stop at the scene of an accident, unlawful driving away of a motor vehicle, carrying a concealed weapon (CCW), two felony firearms charges, three counts of Failure to Stop At Scene of a Serious personal Injury Accident and two counts of failure to stop at the scene when at fault, causing death, three counts of reckless driving causing serious bodily impairment, and two counts of fleeing police officers, first degree. Carrying out Michaelangelo’s little blue coffin. According to court records, Harris previously served seven years in prison for possession of the drug ecstasy, out of a 6 mo.—10 year sentence imposed in 2006. He was paroled on Aug. 22, 2013, to end March 20, 2016. In 2011, a federal judge ruled that sentencing for ecstasy-related crimes is based on “selective and incomplete” evidence and “that it punishes Ecstasy-related crimes far more harshly than is scientifically justified,” according to the American Civil Liberties Union. Harris completed three probation sentences for a variety of crimes in 2005 and 2006, and was found not guilty by a jury of carrying a concealed weapons and two other firearms charges, in 2008. 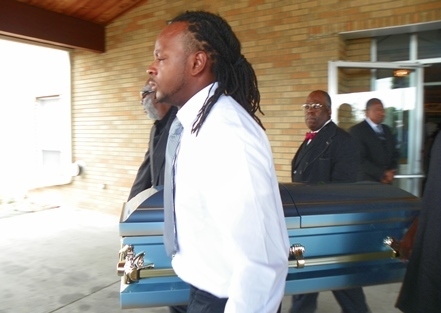 Mourners leave Burns Seventh Day Adventist Church. 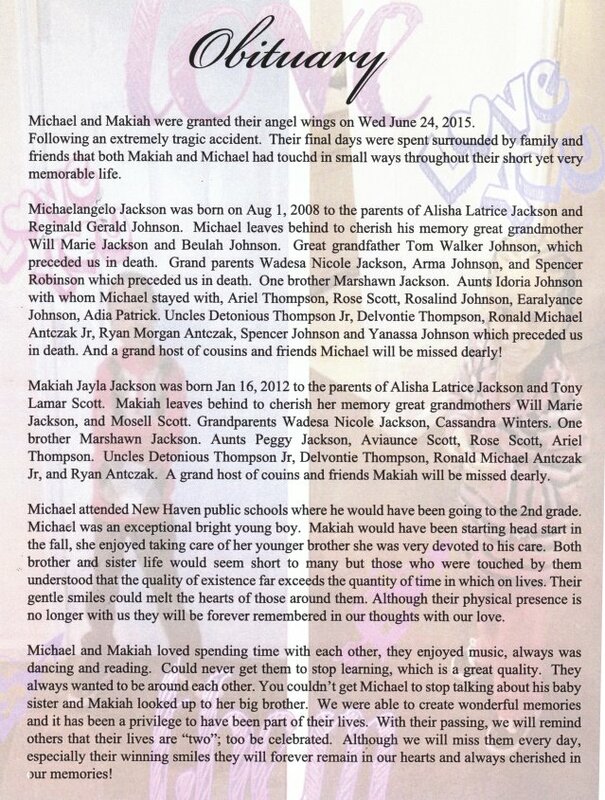 During a somber, sorrowful funeral for Michaelangelo and Makiah Jackson July 2, a young woman sang “The Rose,” a heart-rending song whose lyrics are in the video at the end of this story, along with copies of the obituary. 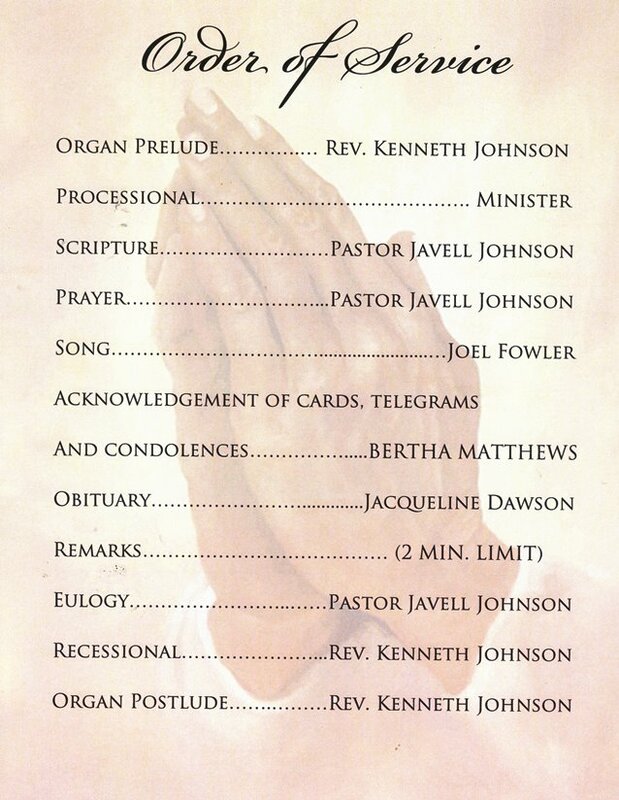 Bertha Matthews read some of numerous cards sent to the family, including a personal letter from Wayne County Commissioner Jewel Ware, and a card from DTE workers who evidently worked with one of the family members. 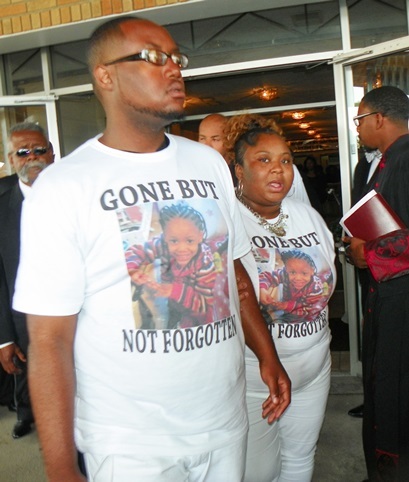 Mourners leave church after children’s funeral July 2, 2015. Flowerbearers for Jackson children outside church. 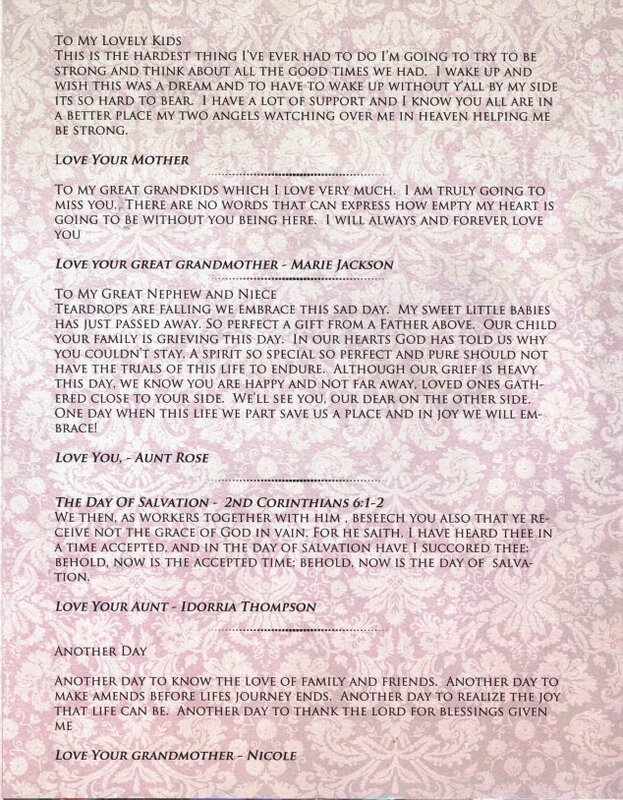 BELOW, JOAN BAEZ SINGS “THE ROSE.” A BEAUTIFUL RENDITION OF THE SONG WAS GIVEN BY A YOUNG WOMAN DURING THE FUNERAL. 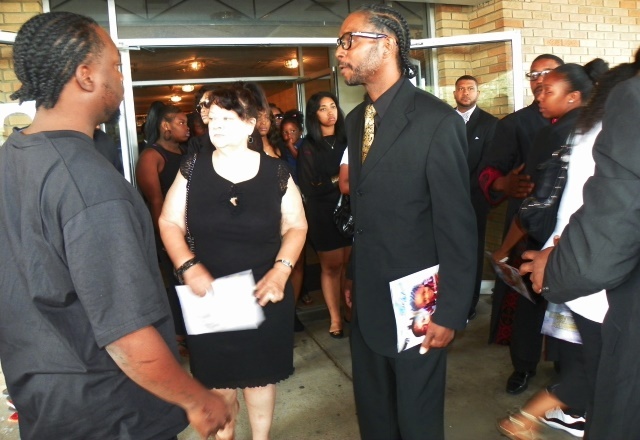 This entry was posted in Uncategorized and tagged Beatbackthebullies, blacklivesmatter, blacklivesmatterDetroit, JusticeforMakiahMichaelangelo, MMCare, PoliceBrutality, policechase, policeviolence, pursuit, saveourchildren, StopPoliceChases, thisstopstoday. Bookmark the permalink.